Look! Look! I met Rachael Ray yesterday while she was out doing a signing for her latest book, Look + Cook. Yay! I confess that even though I love Rachael and her books, I debated going to the signing. The last time I went to a signing event like this, I didn’t get anywhere near the celeb chef. Would it be worth trudging into the city for a potentially slim chance at seeing Rachael? First off, they had one of my favorite things at this event: chairs. That’s right. At 5′ 1″, whenever I go to see any kind of show, it’s almost inevitable that I can hear but not see because all of you wonderful height-blessed people out there are blocking my midget view. 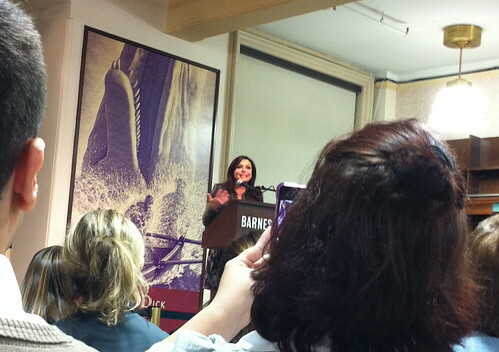 But I got there early, got a seat in the fourth row and got to hear and see her speak. Sweet! Aside from getting to see her in person, it was nice to hear her address a small audience (smaller than she’s used to, anyway) to talk about what the cookbook means to her, as well as other things she cares about like helping pets and donating food. I’ve had a subscription to her magazine for a while and always read her warm & welcoming intros, but was still surprised at how genuine she was throughout the entire signing – both from afar and when I went up to get my book signed. She isn’t faking it; she’s very sweet, has down-to-earth humanitarian priorities and appears to mean the words she writes. That makes it sound like I was skeptical doesn’t it? Well I was a little bit. As much as I love them, it seems like some celeb chefs are everywhere these days (on multiple tv shows on multiple networks, books, kitchenwares, grocery items, magazine covers, the web, etc.). Can they really put that much of themselves into every one of their products and find time to sleep at night? While she didn’t mention how many hours or if she sleeps at all, she assured us that even though it’s her 18th book (wowzers), every recipe is original and that anytime her name is on something, she does have a hand in it. She even shared personal stories about each chapter and certain recipes. She said that with this book as with her others, the priorities remained the same: delicious recipes, accessibility and a high value. For example, she noted that she toiled over whether or not to include dried mushrooms in one recipe because she wasn’t sure if you could find them if you lived in a more remote area. To find out, she called a friend that lived in such an area and had them scope out the scene in the local grocery stores. As someone who regularly visits family in a place where it’s a decent drive to a basic (let alone fancy) grocery store, I definitely appreciated this. Here’s the cover if you haven’t seen it. Note: it’s already got half a dozen bookmarks sticking out of it, haha. I wasted no time. A: She said that she loved how the recipes in this book are great for everyone from starter cooks to seasoned cooks. She loves the pictures because they help you see what you’re in for (as far as techniques, how many pots you’re going to use or exactly what “a palmful” is) and because it feels more interactive than your usual book – like you’re “looking and cooking” with her. 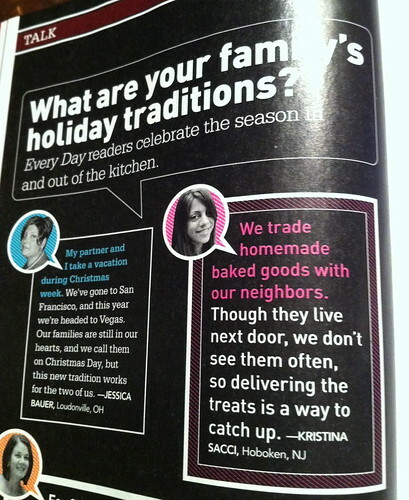 Q: Did she have any other tips (aside from the garbage bowl) for making cooking easier? A: She suggested that you relax in the kitchen, build a pantry that suits your tastes so that you feel comfortable embellishing on a recipe and get a good knife so that cooking isn’t such a task. Because who wants to get angry while they cook? That doesn’t sound fun. Q: What is her favorite recipe in the book? A: She said that she didn’t have one but loves gaging how good her recipes are by the expressions of her loved ones as they taste them. She said they can try to lie and tell her it’s good even if they don’t like it, but she always knows. It’s qualities like that that make her very relatable. She says in the intro to the book’s relatively modest dessert section that she doesn’t bake because she’s competitive and knows that she’s not very good at it. Like most cooks (certainly like myself), she admitted to seeking validation in the kitchen and even though she’s very skilled, she still has something to learn. I definitely went into the signing as a fan of hers, but liked and appreciated her even more afterward. If you’re a fan, you should participate in the community on her magazine’s site. A lot of the mag’s content comes from reader participation. After doing so, I am now on pg. 20 of the latest issue and will have a food photo in the February issue as well. Neat! F. E. A. R. L. E. S. S.
I have that issue! I didn’t realize that was you though. So cool! I was in the issue before that. I would LOVE to get a food photo in. 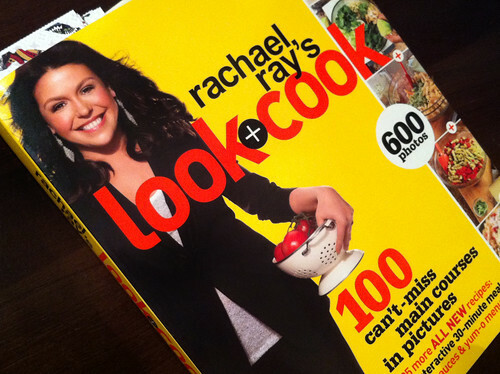 I think of Rachael Ray as a very sharp, savvy business woman. Same as Paula Deene. She does have some good ideas if not a lot of depth to her cooking. I’m glad you had a great time and got to meet her in person. Very cool! I once went to a book signing at my local Borders for Emeril LaGasse back in his heyday when he had three different shows going at the same time on the Food Network. The line was wayyyyy down the block. I waited for almost two hours and it wasn’t even moving and I had company coming for dinner that evening. I bailed out of line and didn’t get to see him. Kudos to you – your patience paid off. Rachael recently did a soup kitchen makeover in a nearby town of Wilmington,Ohio. She did an incredible makeover job and now they can serve a lot more people everyday. I think she is great and I have used several of her dessert recipes, always with good results. It must have been great to actually meet and talk to her.